If you’ve spent anytime around EVF recently than you know I made the jump to freelance. What you might not know is that I have a recurring gig 3 days a week. At that gig I’m using Media Composer and Premiere. This is a huge deal because I’ve literally never even opened Premiere before. In this post I want to give you some of my first impressions of using the software for the last two weeks. I will compare many aspects to Media Composer so if you use either of the NLEs or if you use one and are curious about the other then there should be some goodies in here for you. This is this first time I’ve opened up Premiere. I’ve had zero training. I watched 15 minutes of introductory Lynda.com lessons but those were those basic overview lessons that had no substance to them. I spent the first few minutes getting familiar with the layout. I use After Effects a ton so I’m used to Adobe and how Panels work. I set up my initial workspace and saved it. This worked the exact same as AE. I do like how Workspaces work with Adobe. I gotta hand it to them. There is a slight learning curve figuring out how to move Panels around but once you get it it’s very flexible and convenient. So, okay. +1 for Premiere I guess. My first project was already setup for me. The sequences were already created and VO imported into the project. I had two footage Bins and some title templates in my Project Panel. From here I decided it was time to start cutting and see how it goes. It didn’t take long before something came up. I found the VO and put it into the Sequence. From here I ran into my first issue… How do I do an Add Edit? I want to chop the ten minutes of audio up into pieces and move them around because when the recording was read there wasn’t enough of a pause between sentences. I took to Twitter. I got an overwhelming response with the Razor Tool (C) and whatever the actual Add Edit feature in Premiere is called (Cmd/Ctrl+K). The Cmd/Ctrl+K shortcut was exactly what I was looking for. I realized later on though it doesn’t look like I can make an Add Edit to a blank area of the timeline. Maybe you can but I haven’t figured it out yet. I do this a ton in Media Composer. If I have audio and know exactly how long I want a shot or series of shots to last then I’ll put Add Edits onto the video track(s) just as a placeholder. So then I can come back and hit T in MC or X in AE and quickly edit in the shot from the Source Monitor. I had a choice to make – do I learn the Premiere shortcuts or change them to Media Composer’s? I choose to take the difficult route and learn Premiere’s default shortcuts. Why? In the long run it will be better to know the software in full, like I do for MC. Even if I don’t or won’t like it as much, I want to learn Premiere like I did for Media Composer – 100%, no bad habits, used as the designers designed it to be used. I like the three point editing hierarchy in MC so much better. I don’t like how in Premiere I have to choose to ignore the source or the sequence in or out point when I have all four points created. In MC there’s a hierarchy that decides which in/out points to use automatically. BTW, anyone know how to clear and in or out point in Premiere? I know it’s a Google search away but haven’t done it yet. I jotted down a bunch of notes over the past two weeks. I want to run through them rapid fire-style. The different trim modes in Premiere are still driving me crazy. I understand the yellow and red trim modes (sorry, still don’t know their names) but my red trims won’t work when two clips are butted up next to each other. There’s gotta be a way to get this to work; just don’t know how to yet. My project is in 720p but all my clips at 1080p. It wasn’t setup with something like FlexFrame in MC where all the clips were automatically resized. I was told to just go in individually and adjust the scale once the clip is edited into the timeline… Is there no other way?! I’m digging the preset effects and transitions. I’m not sure if these come stock with Premiere or the company I’m working at purchased them. The Title Tool is wonderful and awful all at the same time! Creating titles is a breeze. It’s just like AE. But managing titles as media in a project is mind-bogglingly dumb IMO. I’m slowly getting the hang of it but I’ve screwed up this process a handful of times already – updating a title in one place but accidently changing it in another. Work in progress I guess. Non-Premiere comments… It’s incredibly weird 1) to be in a new edit bay and 2) be working on a PC. It took two weeks but I finally found the RGB Parade. Still like color correcting in MC better but love how the RGB Parade looks and works in Premiere. The next two paragraphs are completely personal opinions about Premiere and Media Composer. Take them for what they are – an opinion based on one’s experience. I love Media Composer. Two weeks in Premiere makes me love MC even more. But Premiere isn’t so terrible. Most of my issues are just because I don’t know how to do things. This is my fault; not Premiere’s. I’m sure my personal opinions will change. I get upset when I know what I want to do but I can’t. So I blame the NLE, not it’s operator. I love the rigidity of MC – I’ve build two different media departments around it. Premiere seems fluid…which is good and bad. Depends on how you look at it. Premiere seems to be “up with the times” while Media Composer is still old school. Maybe is it time for me to be “hip”? 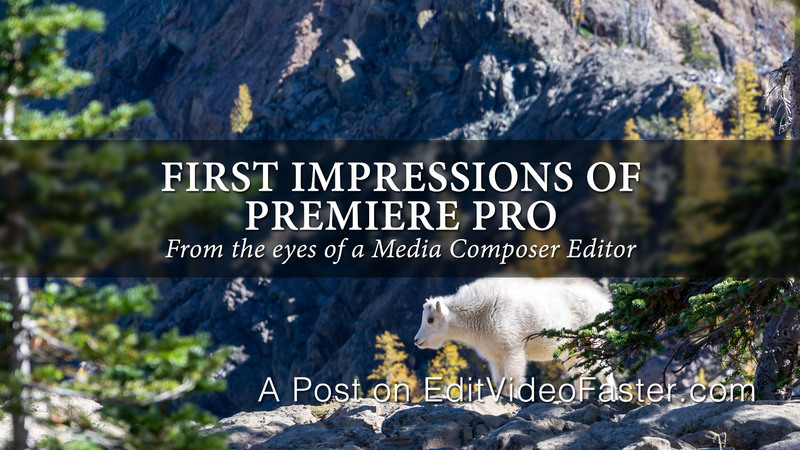 I hope you enjoyed this look at my first impressions of Premiere Pro. If you’re new around here I’d love for you to go here and sign up to receive email updates about new posts and get the Video Editor’s Digest – a weekly newsletter with tips, tricks, resources, links, opinions and more about becoming the best editor you can be. If you have any thoughts on making the jump to Premiere or any of the features I talked about above, I’d love to hear them in the comments! just learning Premier too, after ages on MC. its very much like FCP. dont know it well enough yet to make any opinion. It’s a different learning experience for me. When I was learning MC I was learning how to edit too. I had next to zero instincts on how to do something. If the situation was reversed I’d probably never have a need to make an Add Edit on black but since I know about it and it’s something I use ALL the time, it really throws a wrench into my editing. I’ll get it down and initiate new workflows but it takes time. You’ve probably figured this out by now (since I’m reading this post 3 months late) but Premiere does not treat a gap as filler like Avid. It’s much less “linear” in that sense. I switched the add edit to Shift+C (since C activates the razor tool). Premiere is really very similar to FCP7. Avid is kind of it’s own beast. Trimming takes some getting used to but you can modify your tools to make them more Avid-like. The replace edit from Avid is incredibly useful and not a default in Premiere. I had to manually add it to my keyboard shortcuts. In regards to mismatched source footage and sequence presets my advice would be to drag a clip with the resolution you hope to master to into a new sequence and have it match the settings. If you need to adapt mismatched settings you can easily make the change on one clip and do the old Final Cut Copy then Paste Attributes trick to many clips at once. I enjoy editing in both NLE’s. I’d definitely stick with Avid for longer projects that were primarily just cuts. However, when I’m in Premiere I feel way more free to be creative. The integration and dynamic linking with the whole Creative Cloud suite is invaluable. Avid has always felt a little like a closed box to me – kind of like you’re on an island. Oh! The one thing I highly recommend is to buy different keyboards for each NLE. I have an Avid, Premeire, and FCP keyboard. I swap them out depending what I’m working on because it always takes me about a week to get back in the x-cut groove. Looking down at the keyboard is a lot easier than googling or menu hunting all day. I figured out the 1080p media in 720p project issue I was having. If you right-click a click and choose Set to Frame Size it’ll scale the selected clip(s) down to the size of the sequence. So my 1080p clips would scale down to 66.7%. It’s actually kinda confusing because there’s another option that’s Scale to Frame Size (or something like that) and this will resize the clip so it’s essentially 720p scaled to 100% instead of 1080p scaled to 66.7%. AND the best part is is that you can set it as a shortcut so I made mine Shift+S. I edit in a clip(s) then select them and hit my shortcut and they’re scaled down automatically! I think, as you said, it just comes down to you learning Premiere when you already have some expectations based on your MC experience. I had the same issue when I was trying to learn MC coming from FCP and Premiere. This is why I personally prefer Premiere, since it is the workflow I am used to. I know that it still has some limitations compared to MC, especially for working on bigger projects where you need multiple computers working together on the same feature film for instance, but for the general editing tasks I find it more comfortable for me even on the interface level. Any way. Here are a couple of answers for your questions. 1) To manage titles better in Premiere, all you need to do is create a specific bin for them to keep everything organized. From here you won’t need to do anything in the project panel. Add your first title to the timeline and adjust the timing as you like. If you need to create a new title, instead of copying and pasting the one you already have on the timeline, click the Alt/Opt key and drag the title you have on the timeline as if you are moving it to a new location. Then, release the mouse and the Alt/Opt key. This creates an actual copy of the title in the project panel without you having to do it yourself, and now when you change the second title, it won’t affect the first one. 2) As T.J. Imbrigiotta said, Premiere doesn’t treat gaps the same way MC does (one of the things that drove me nuts about MC :D). However, there is a workaround for you if you need to use the same technique in Premiere. All you need to do is to go to File menu > New > Black Video. This creates an empty video file for you that you can drag to the timeline and cut it as you like, then replace it with the footage you have when you are ready. Thanks, Abdelrahman! Those two tips are really helpful. Can’t wait to put them to use! I hear you about workflows. I feel like wherever you get your editing roots from you’re going to be tied to that way of thinking unless you spend a ton of time in the new NLE.